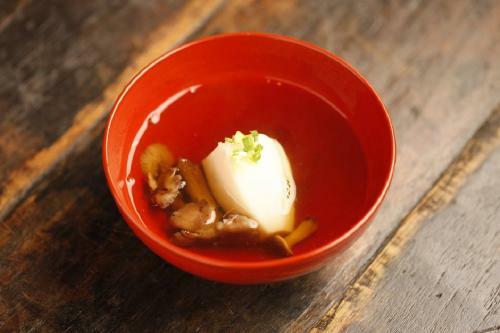 Home › Style › “Satoyama Jujo” has transformed traditional food from Japan’s snow region which many people feel nostalgic about into a beautiful and elegant cuisine. The “Satoyama Jujo” is created by Jiyujin Ltd. which is well known for its lifestyle magazine “Jiyujin” and it is a really popular hotel and difficult to make reservations. 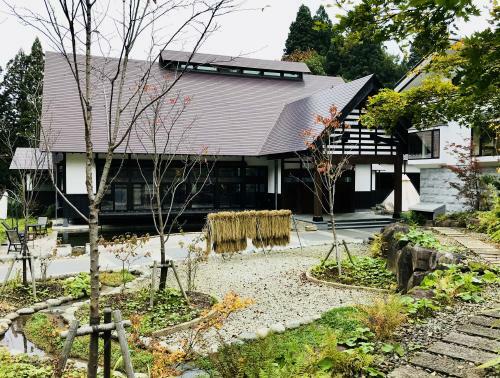 The owner Mr. Toru Iwasa, is also the chief editor for the Jiyujin, and he took over an old inn and renovated it to successfully set up the Satoyama Jujo. 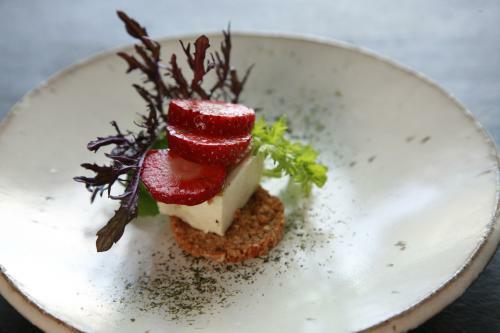 At its restaurant, it serves beautiful and delicious dishes which use vegetables grown in the local region, aiming to introduce gastronomy to its localities. 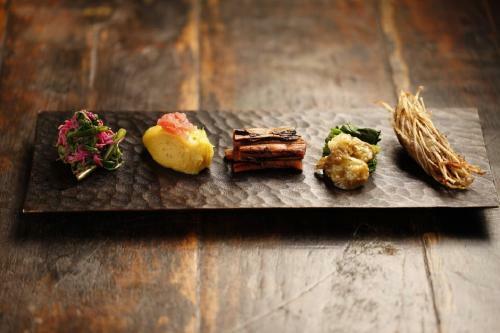 The dishes “are simple but are tastefully prepared” which attracts many customers to visit for the Satoyama Jujo. 1 Satoyama Jujo is situated in Minami-Uonuma city, in Niigata prefecture and the journey from Tokyo takes under 2 hours. 2 The best rice-producing region in Japan. Dishes prepared with various seasonal vegetables are delicious for your taste buds and your eyes. 3 The variety of vegetables change as the seasons change. The dishes that use seasonal vegetables are a real treat, beautiful to behold, kind to the body and sink into your consciousness. 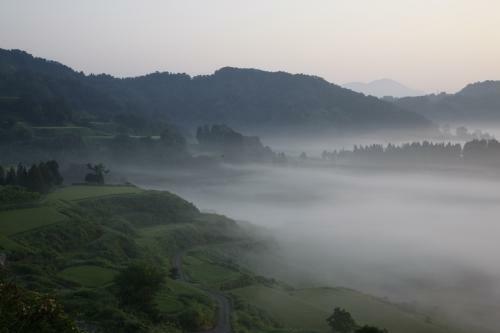 Satoyama Jujo is situated in Minami-Uonuma city, in Niigata prefecture and the journey from Tokyo takes under 2 hours. The Satoyama Jujo is a beautiful hotel located in a beautiful remote area. It is surrounded by a peaceful landscape with bags of atmosphere. The sound of “Satoyama” is nostalgic which makes you associate with the good old days and makes you feel warm hearted. The hotel is branding itself with 10 key concepts which are narrated in the “10 stories of mountain village life”. The first story is about its “food”. This is one of the big reasons it receives a high degree of media coverage. 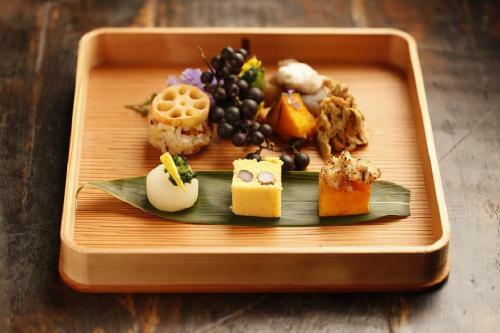 Why does the food served at Satoyama Jujo get a lot of attention? 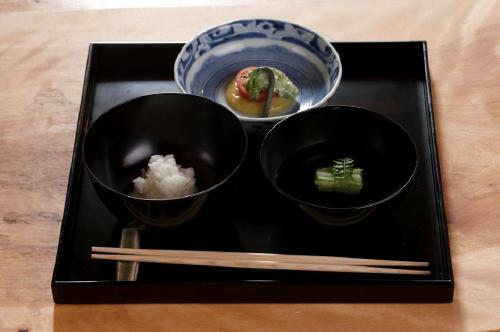 The reason is because it’s different from the luxurious dishes served at a usual Japanese style inn, it serves dishes which “use locally grown ingredients and the ingredients, mostly vegetables, are used to their full potential to make the dishes so delicious” and they are very popular among visitors. 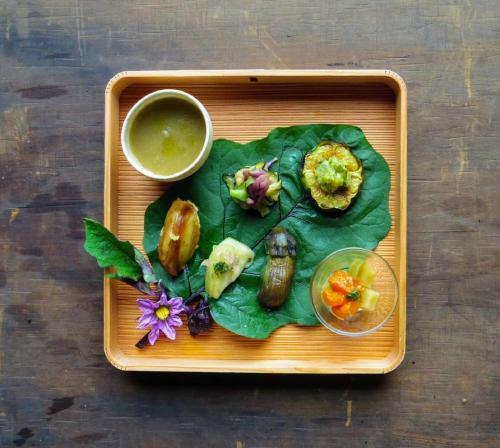 These popular dishes are served at the hotel’s restaurant which is called “Organic and Creation – Sanaburi-”. 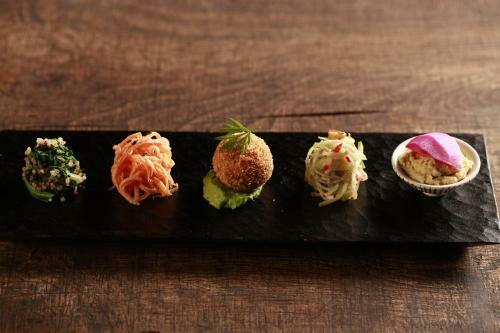 Customers can make an advanced reservation for the vegan, vegetarian, and macrobiotic requirements. The food ingredients are mainly wild mountain vegetables, nuts, and mushrooms which are picked by the restaurant staff and organic vegetables which are farmed by its staff. Of course, this harvest from the local mountains is natural and chemical-free and it gives you a dynamic power through the dishes. Come to think of it, it is nothing special as it is the traditional and cultural diet which has been blended into the life of people in the Uonuma area and this has continued culturally for a long time. There are 3 food-creators at the restaurant who have tailored the traditional and cultural diet into modern “gastronomy”. then he worked as a head chef for the Japanese restaurant chain “Guiloguilo” and has also experienced owning his own restaurant. The next food-creator is Ms. Keiko Kuwakino who has mastered Ayurveda and Yoga whilst staying in Australia and India, and she has also lots of experience preparing many vegan and vegetarian dishes. Lastly, Mr. Toru Iwasa who is the owner of Satoyama Jujo and is also the Representative Director/ Creative Director for the “Jiyujin Ltd.” Currently he is very busy travelling across Japan engages in renovation projects, holding seminars, pursuing new food ideas, and editing his works. The above three food-creators bring about “simple but tastefully prepared” and delicious dishes. I hope you will go there to taste and experience their wonderful food! Here are some images of once-in-a-lifetime seasonal dishes (they won’t be the same again) for now you can enjoy them only with your eyes! The best rice-producing region in Japan. Dishes prepared with various seasonal vegetables are delicious for your taste buds and your eyes. Satoyama-jujo is located in Mt. Osawa which is part of the Koshihikari rice producing Uonuma region. 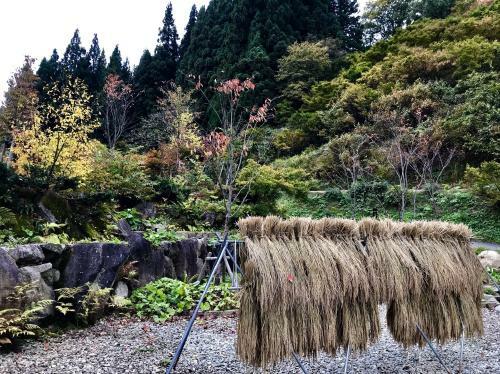 It is a well-known fact that Uonuma is one of the best rice-producing regions in Japan. Scent of freshly cooked rice! Soft and glossy rice! Wow, it’s to die for! 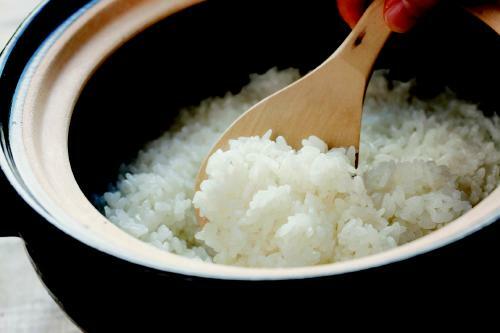 Rice is the best staple food for Japanese people! At Satoyama Jujo, rice is cooked in earthen pots on the table in front of the customer. While the rice is cooking, customers can enjoy this traditional process whilst eating, chatting and drinking! Talking about drinking, yes! Where there are rice-producing region obviously there is also Japanese sake being produced! Niigata prefecture has a wide range of sake to choose from. In recent years, the natural wine produced in Niigata is catching people’s attention. Of course, you can also try this natural wine at the Satoyama Jujo as well. The local region has heavy snowfall during winter and when spring comes the snow takes time to melt and soak its way through to the ground. This melted water is delicious and full of minerals with abundant nutrients, and this delicious water has a big influence in the nurturing of the area’s rice and sake. 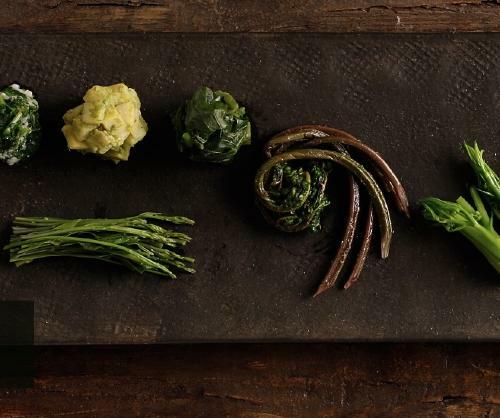 The variety of vegetables change as the seasons change. The dishes that use seasonal vegetables are a real treat, beautiful to behold, kind to the body and sink into your consciousness. 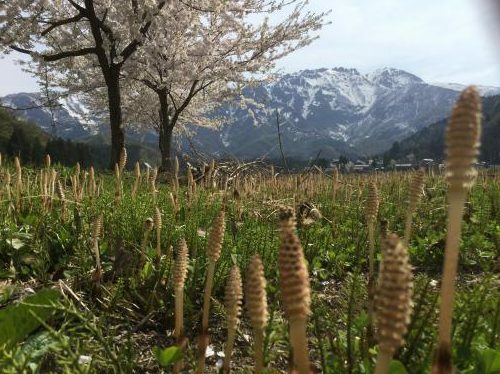 The beauty of spring at Satoyama Jujo is beyond words. The arrival of spring comes late in the snowy mountains. Around Golden-week in May, spring first appears and snow starts to melt. This is when the wild mountain vegetables are ready for harvest. 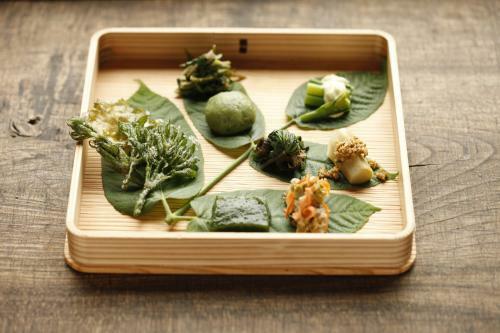 The main dishes served at the hotel are of course prepared with these wild mountain vegetables. 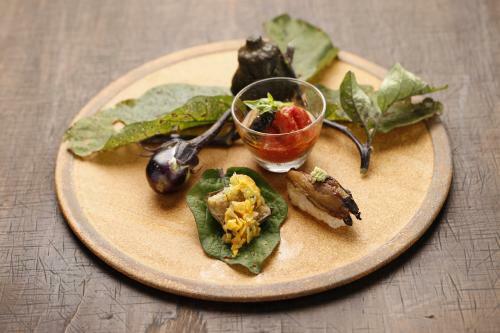 The chief chef for Satoyama Jujo goes to the mountain by himself to harvest the wild mountain vegetables! 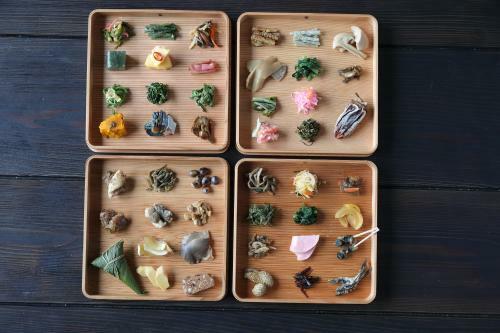 Some of these wild mountain vegetables follow the traditional practice and are stored for use in winter! The food-creators prepare food in readiness for the winter ahead! The Fukinotou plant (bud of Petasites japonicus) grows in the snowy mountains is a light yellow-green in color. It starts to appear after feeling the warm sun light come through the snow and it is said that growing under the snow make it taste softer. 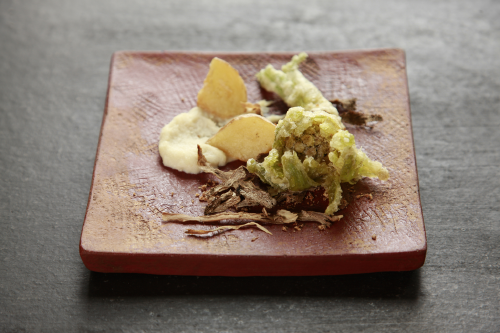 Wild mountain vegetables are going through various time-consuming processes and finally ending up in our stomach! They are greatly appreciated! Summer is the season for eggplants! Eggplants can be cooked in so many different ways and please enjoy the changing eggplants! The color of eggplants looks very fresh! There are many traditional varieties of eggplants in Niigata. 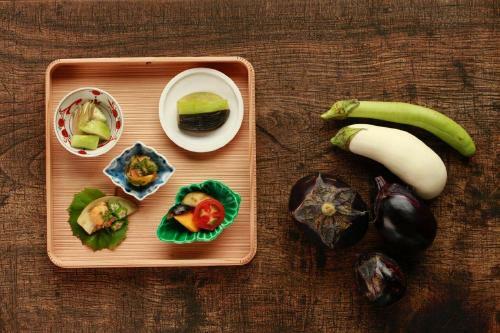 “Osawa-nasu (Nasu means eggplant in Japanese)”, “maru-nasu”, “Nakajima Kincyaku nasu”, etc… there are up to 20 different varieties of eggplants in Niigata! The eggplant is a healthy vegetable. Its skin contains a high amount of polyphenol. The amount of production of traditional vegetables in Niigata is limited. As these vegetables are not generally sold in the market, it is difficult to obtain various types of traditional vegetables constantly. If you happen to have some traditional vegetables in your dishes you are very lucky! Eggplant dishes are available between summer and fall. In the mountains, nuts and fruits are starting to be harvested. 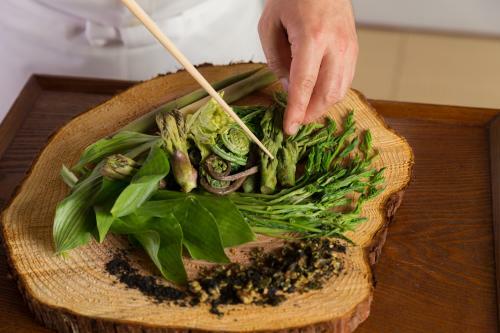 Seasonal harvest such as figs, sweet chestnuts, ginkgo nuts, Akebi plants, Sarunashi (hardy kiwi), wild vines and propagule are beautifully present in the restaurant’s dishes. Sometimes wild mushrooms are prepared. Eating root vegetables and mushrooms will warm up and relax your body. 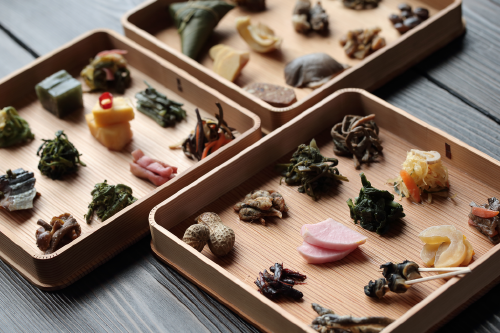 In winter, finally the preserved and fermented wild mountain food and vegetables from spring and autumn are presented in the dishes! 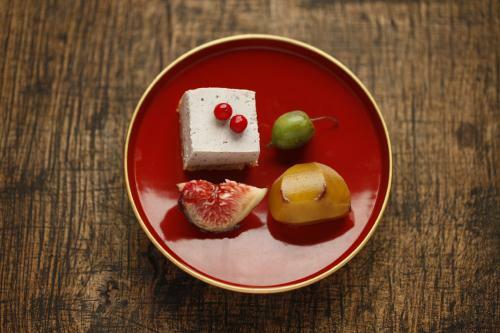 It is a time-consuming process to make this preserved and fermented food, but look! It is really worth it! And there are so many varieties of them! They are prepared without any additives or colorings. Their beautiful coloring is derived from the vegetable itself and looks so appetizing. Amazing! The wild vines which had to survive the harvest with strong competition from bears (it sounds like a joke but it is true!) are presented on the dish! The vegetables prepared depend on the day and the season so the menu changes day by day. The hotel offers a wide repertoire and if you stay for a couple of nights you won’t eat the same dish twice. 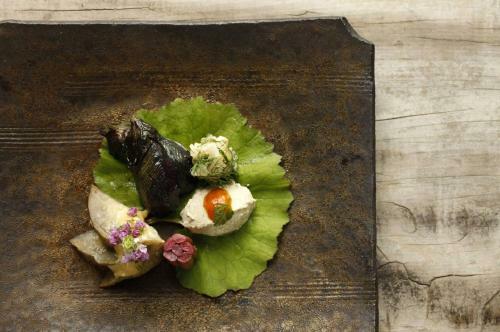 Did you enjoy this report about the food at Satoyama Jujo? 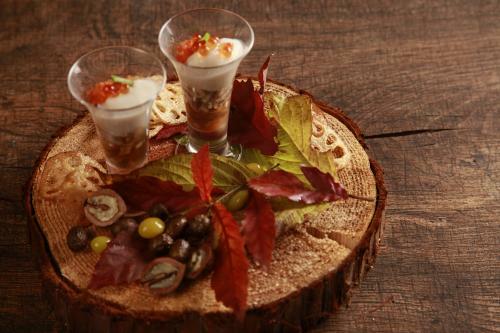 I hope many of you are touched by the spirit and passion of Satoyama Jujo for their food. After this interview, I now understand more about the local gastronomy as an art in tasting the goodness and tradition of local ingredients by using your five senses. *The information contained in the article is as of the date when we interviewed and subject to change.